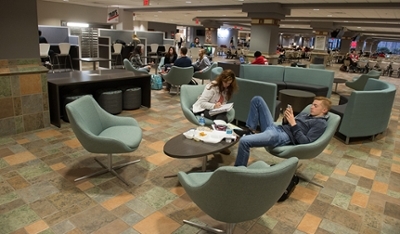 Southern Illinois University Edwardsville students returned from fall break to find a comfortable new area for studying and socializing in the dining services area of the Morris University Center. New seating, tables and plug-in stations offered a useful space, with a refreshing vibe. Multiple students enjoyed the fresh atmosphere upon their return to campus. According to Waple, the next phase will include more couches and high top tables throughout the dining space and down the hallway. The revamped layout will limit wasted seating space. 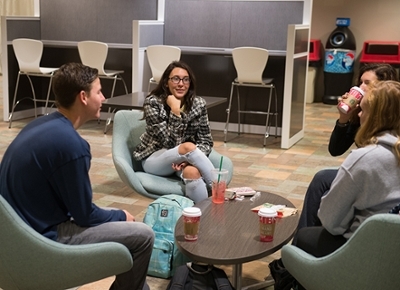 Photos: Students enjoy the renovated seating area in the Morris University Center.